When the Democrats reclaimed the White House in 2008, the hoopla about the tall, young African-American with the Muslim name was appropriate, but the presence of the man next to him in victory was only slightly less improbable. The would-be successors who lined up to take the Presidency from George Bush were numerous enough to successfully invade a small protectorate. Just as in any other wide-open Presidential contest in American history, many of those imagined contenders would come from Congress’ upper house. Never mind that only two sitting Senators had been elected directly to the White House in the last 120 years, and the one whose father wasn’t Joe Kennedy was Warren Harding—the man whose candidacy literally invented the term “smoke-filled room” and was as corrupt and improbable as his Presidency. Nearly no one sits in that august chamber every State Of The Union without believing in their heart that they’re close enough and smart enough to be President. After nearly two terms watching the Executive Branch from the cheap seats, and the first ones to take the helm to return their party to the White House are a 78-year-old former Senator from Alaska and the recently retired governor of Iowa, with a polarizing woman and a black man less than two years removed from the Illinois State Senate warming up on the sidelines, even Chris Dodd could have been forgiven for thinking he had game. Senator Joe Biden’s belief that he could emerge as the leader of this very crowded pack seemed different than most of the legislative aspirants who imagined themselves Winston Churchill every time they appeared before C-SPAN’s cameras speaking to an empty gallery. The Man from Delaware had looked on during more than 30 of those annual Presidential addresses, by seven different Presidents. And every four years, he had watched countless man of tiny stature and tinier resumes answer a call that no one around them heard. Through Watergate, Iran-Contra, and the Whitewater adultery fallout; through America Held Hostage and watching his President don a cardigan and tell a malaised nation to turn down their thermostats, Biden watched Presidents slice themselves into the rough and then desperately try and hack their way out. No statesman of modest ego could watch such a spectacle without begging for one shot with his six iron to show the world his mettle—and no one ever called Joe Biden’s ego modest. Once he’d even answered the call himself—only to be chased from the race as a plagiarist and a national laughingstock. Pilloried and humiliated, the nation and Delaware allowed him to quietly slink back to his Senate seat and reclaim at least a modicum of his reputation. Most men would have considered such redemption a gift from the American Second Act Gods, and coasted their way to full pension and a municipal airport named after them. Biden never shrank from the stage, though. When it came time to name the successor to another two-term Republican President, there was Joe Biden, ready to surrender what dignity he’d been fortunate enough to reclaim and subject himself to another endless season of plagiarism and hair-plug jokes. Granted, times had changed, thanks in large part to Bill Clinton proving that a serial adulterer with the taint of drug use and calculated evasion of military service could have his often tawdry, craven, and duplicitous past exposed and still win the Presidency. Still, as a now-respected elder statesman of the Senate, aching and bruised from years of slapfights with the media, most sexagenarians might have said “No thanks” to painting that kind of bull’s-eye on their expansive back. That he was so ready to walk headlong into that whirring turbine seemed perfectly in tune with the Biden ignorance of limits—and, sometimes, boundaries–that the American people had come to know over three and a half decades. Americans could and did say a lot of things about Joe Biden, but by 2007 few doubted his willingness to put himself in a position where he’d put his dignity on the line to get his point across. Having grown up with a terrible stutter, Biden’s brazen streak developed early, and he compensated for his speech challenges by being the first to take the dares the other kids wouldn’t. When he conquered his stutter, the thoughts couldn’t roll off his tongue fast enough, and he spent the next decade and more of his life letting his words fly with impunity, believing he could talk himself through any door. 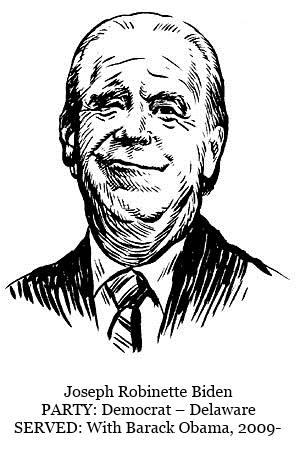 An aggrieved opponent’s PR flack once said, “The only thing Joe Biden ever ran was his mouth.” Campaign rhetoric aside, he had indeed done plenty of that through his life. An unremarkable and sometimes touch-and-go college career led to an unexpected admission to law school—where, on Biden’s first day, a law professor put a question to the class and called on “Mr. Bidden”, who answered, “I’m unprepared”—and then corrected the professor’s pronunciation of his name. His improbable trip through law and local politics saw him elected to the U.S. Senate at the age of 29—the second-youngest man ever elected Senator. As transformative experiences, those early triumphs were nothing compared to what befell Biden on December 18, 1972, shortly before he was due to be sworn in as Senator. A tractor-trailer traveling at highway speed hit the Biden family station wagon, killing his wife, Neila, and 13-month-old daughter. His two sons were hospitalized with serious injuries. He took his oath of office two weeks later in his injured son, Beau’s, hospital room. It’s understandable that a life tinged with this measure of adversity and tragedy would cultivate a defiant tendency to dare the gods to do their worst. Consider that this relatively short life had seen an embarrassing childhood affliction, a national humiliation and the near-death of his career, two life-threatening aneurysms, and the sudden loss of his wife and infant daughter one week before Christmas and two weeks before a job only four other men his age had taken and that at least half the voters in his state (and who knows how many politicos across the nation) felt he was unqualified for. Most wouldn’t have judged him if he’d chosen to grow a beard and drink his way through the rest of his short, haunted life. With a typically exuberant indifference to his dignity, he threw his hat in the ring again in 2007. He washed out early, as almost every expected he would. With his tenured Senate seat awaiting him, he willingly perched himself on the grandest dunk-tank platform in American Politics, and dared a nation of professional and armchair politicos to send him into the drink. With his customary bizarre self-confidence, he seemed to believe he’d serve his eight years without a drop of water getting on him—and even if he did, it wouldn’t be the first time he had to towel off in public. Months earlier, in July 2006 on C-SPAN’s Road To The White House, Biden was thanking an Indian-American for his support and, in his own unique welcome to the land of opportunity, observing, “In Delaware, the largest growth in population is Indian-Americans moving from India. You cannot go to a 7-Eleven or a Dunkin’ Donuts unless you have a slight Indian accent. I’m not joking.” Unfortunately, he wasn’t. Within two weeks of joining the ticket, he heartily endorsed his selection by Obama by saying of Obama’s erstwhile rival, “Hillary Clinton is as qualified or more qualified than I am to be vice president…Quite frankly it might have been a better pick,” and at a Missouri rally invited State Senator Chuck Graham to “Stand up, let the people see you.” From his wheelchair, the paraplegic Graham couldn’t oblige. THE KINN’S SPEECH: Biden might have picked a better subject on which to assail a rival than his oratorical proclivities. Few in America—and certainly not his fellow competitors for the Presidency—forgot what had happened the last time Biden had run for the Presidency. During a campaign event in Des Moines, Biden lifted liberally from a speech by British Labour leader Neil Kinnock in waxing poetic about the hardscrabble upbringing from which he came. It was the same speech he’d cited with attribution in many stump appearances before and many more in the weeks to come—except this day in Iowa, Mr. Kinnock’s authorship was not acknowledged. That omission was not his undoing, however. Of greater concern were a few conspicuous rhetorical flourishes more native to Wales than Scranton, PA, including references to attending “university” and his ancestors coming up for four hours of football after twelve hours in the coalmines. Even with all that tinder at his feet, he might never have gone up in flames had the campaign manager of a fellow New England presidential rival not been at the ready with a book of matches and a helpful comparative videotape as accelerant. Even then they still had a chance to douse the flames before they took hold, with a sympathetic press reporting that Biden had often used the Kinnock passage with attribution. That chance pretty much vanished when another speech turned up from California where he lifted a passage from Bobby Kennedy, followed by the disclosure that he’d faced identical allegations at Syracuse Law School. Some accepted his explanations that he’d simply been careless with Kinnock and in law school, and that an aide had inserted the Kennedy line without telling him. But as a lawyer he surely knew that all of that taken together, with back-to-back clips of him mimicking Kinnock verbatim, there wasn’t a jury in the world who would acquit him. “Joe…Joe…Don’t lose every friend you have in the world.” – Jill Biden, in a deliberate stage whisper, trying to keep her simmering husband from exploding at a room full of senior campaign volunteers offering their input on the presidential campaign he was about to announce to the nation. As a young newlywed in his early 20s, Biden and his wife named their German shepherd puppy “Senator”, or “Tor” for short.